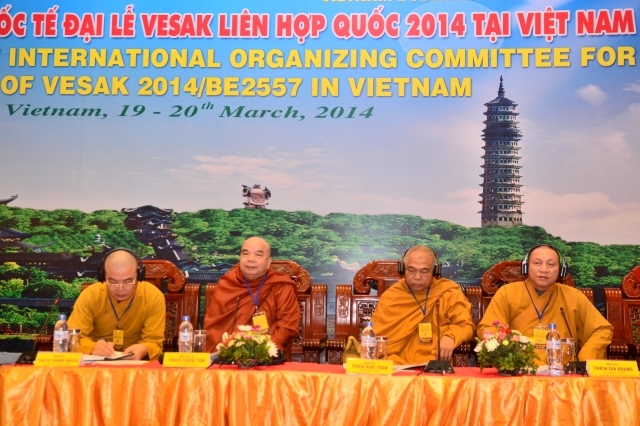 On 19/03/2014 evening, at Bai Dinh temple, the 2nd preparatory meeting of the International Organizing Committee for the UN day of VESAK 2014 was taken place. 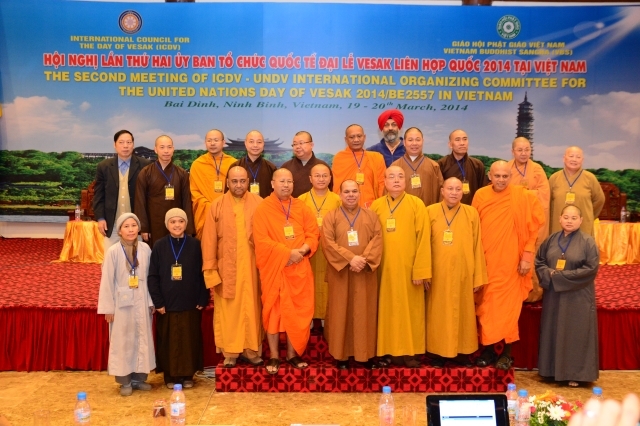 On Vietnamese side, there was the participation of Most Venerable Thich Thanh Nhieu - Standing Vice President of Executive Council of National Vietnam Buddhist Sangha, President of the UN day of Vesak 2014 International Organizing Committee; Most Venerable Thich Thien Tam - Vice President of Executive Council of National Vietnam Buddhist Sangha, Vice President of the International Organizing Committee; Most Venerable Thich Giac Toan - Executive Council of National Vietnam Buddhist Sangha, Vice President of the UN day of Vesak 2014 International Organizing Committee; Professor Doctor Le Manh That - Member of ICDV; Most Venerable Thich Gia Quang - Head of Information and Communications, Vice President of the Organizing board; Venerable Thich Tho Lac, Head of Executive Council of National Vietnam Buddhist Sangha in Ninh Binh province, Vice Secretary General of the International Organizing Committee; Most Venerable Thich Nhat Tu - Vice Secretary General of the International Organizing Committee; Venerable Thich Quang Thanh - Vice Secretary General of the International Organizing Committee. 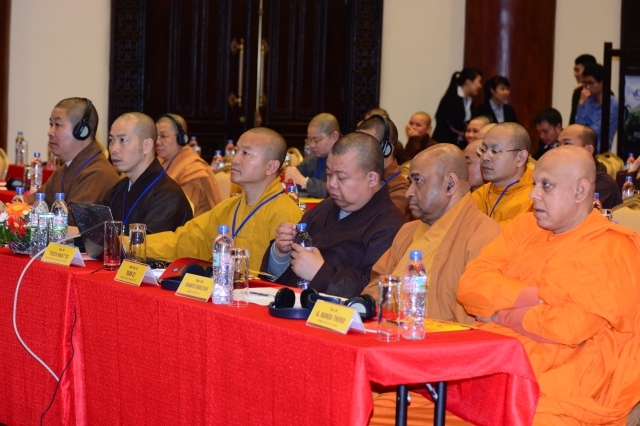 On international side, participants were Most Venerable Doctor Tampelawela Dhammaratana - Vice President of ICDV; Most Venerable Doctor Phrasophonvachirabbhorn - Member of ICDV; Most Venerable Doctor Yuan Ci, Vice Secretary General of ICDV; Most Venerable Bhante Chao Chu - Member of ICDV; Most Venerable Doctor A. Nanda Thero - member of ICDV, Sri Lanka; Mr.Goh Seng Chai - Vice Secretary General of ICDV. 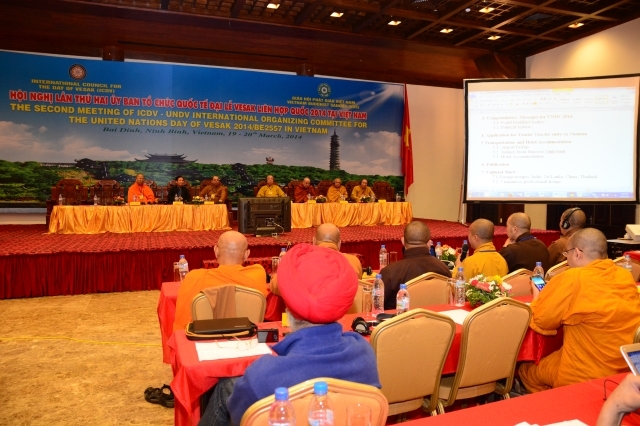 Earlier in the morning, members of the IOC have had a brief meeting on the main issues. 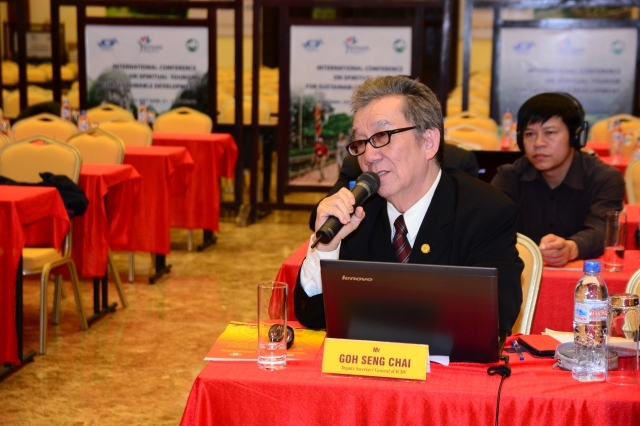 In the afternoon, the IOC discussed more details on each specific issue in the official session. 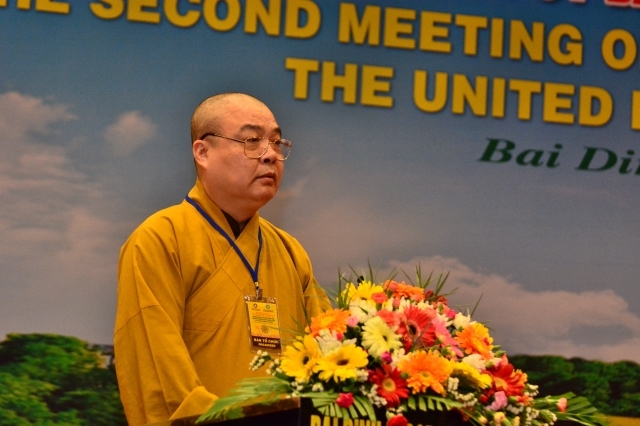 In his opening speech, Most Venerable Thich Thanh Nhieu specified that this is a big event of National Vietnam Buddhist Sangha in particular and Vietnam in general. 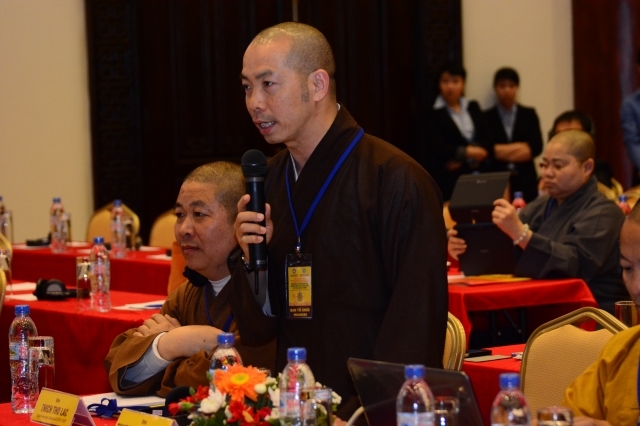 Thus, there were still shortcoming issues which are needed to be discussed and solved from the International Organizing Committee. 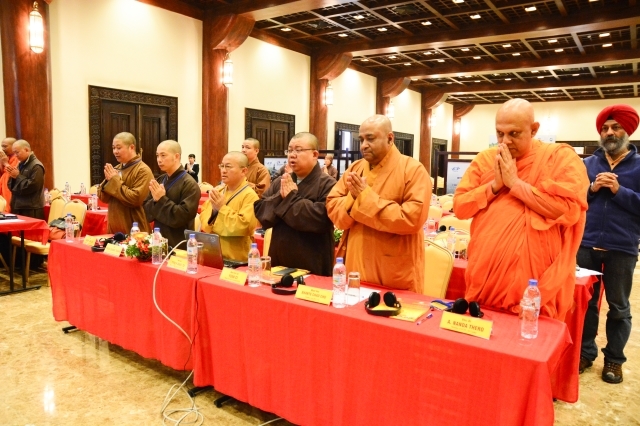 Moreover, Most Venerable Doctor Tampelawela Dhammaratana - Vice President of ICDV praised the Vietnamese IOC’s effort to perform the best to achieve a successful celebration. 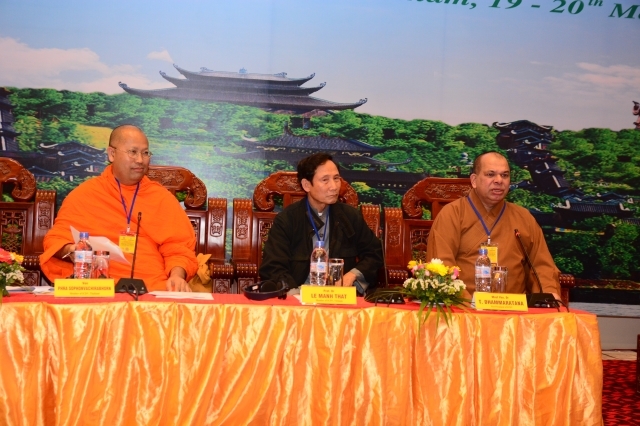 Most Venerable Thich Thanh Nhieu and Most Venerable Doctor Tampalawela Dhammaratana were entreated to be the chairmen of the meeting. 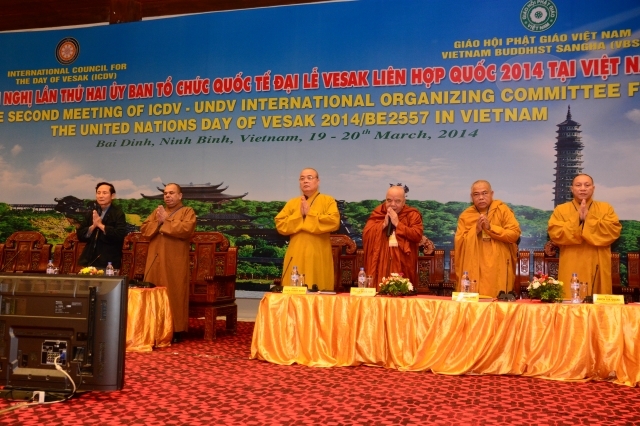 To get into the working agenda, Most Venerable Thich Nhat Tu - Vice Secretary General of the IOC reported that the 1st preparatory meeting taked place on 24-25/11/2013 in Ha Noi and preparatory tasks for the UN Day of Vesak 2014 of National Vietnam Buddhist Sangha. According to him, the IOC had sent invitation letters to 95 countries all over the world. 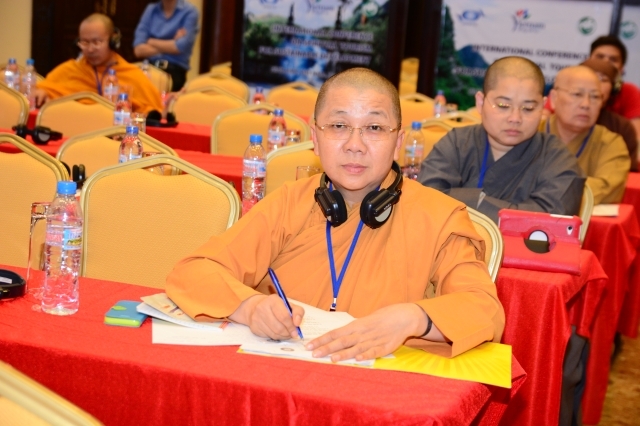 The conference was interesting in solving air tickets, registration mode and participated registration period for the international delegates, visa issues for the participating delegations. 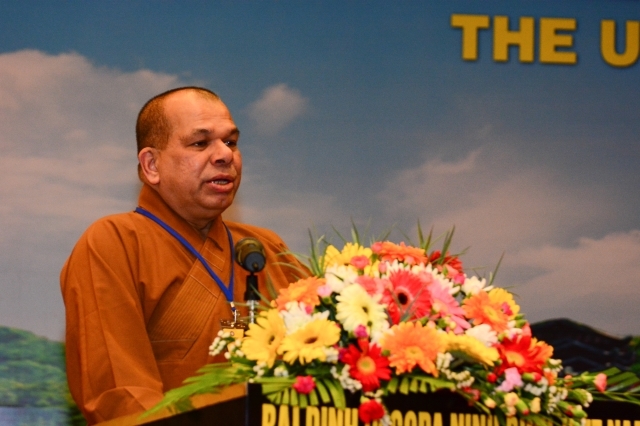 During this celebration, it was expected that there would have the participation of very important international characters such as Prime Minister of Sri Lanka, King Siha Moni of Cambodia, Princess of Thailand and Princess of Butan. 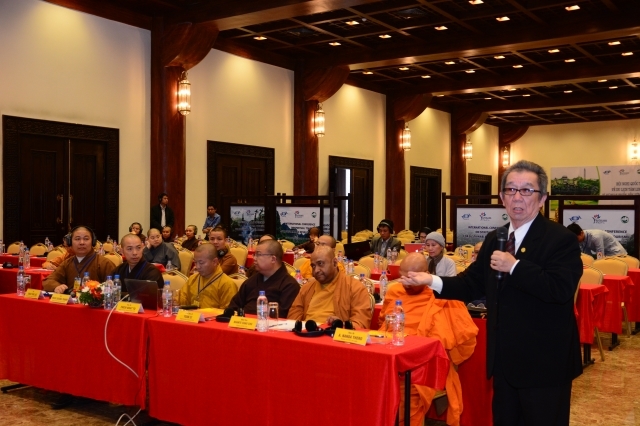 For greeting tasks at Noi Bai airport, taking delegates to hotels in Ninh Binh, allocated them to the hotels and security were presented and given out specific plans by Vietnamese IOC. 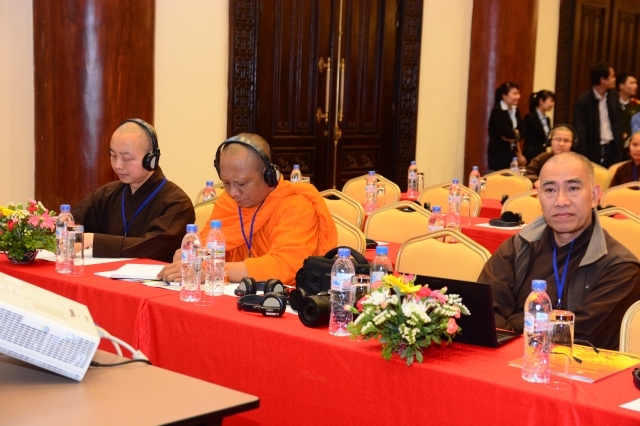 Regarding to the scientific workshop, the IOC already held six special themes in which there was one of Vietnamese languages. The IOC selected 180 articles with good quality from 90 authors all over the world. 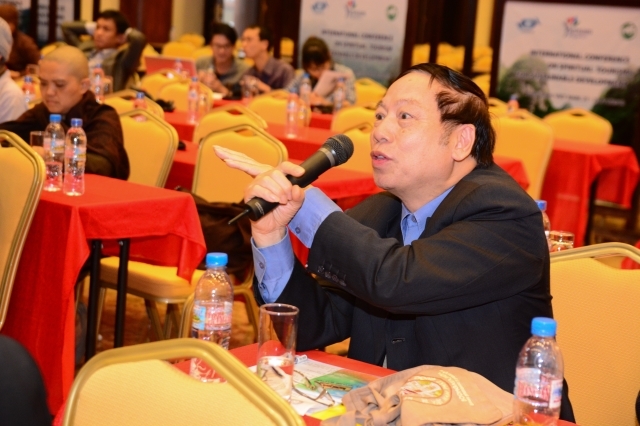 These articles would be translated into Vietnamese and widely published in both Vietnamese and English. 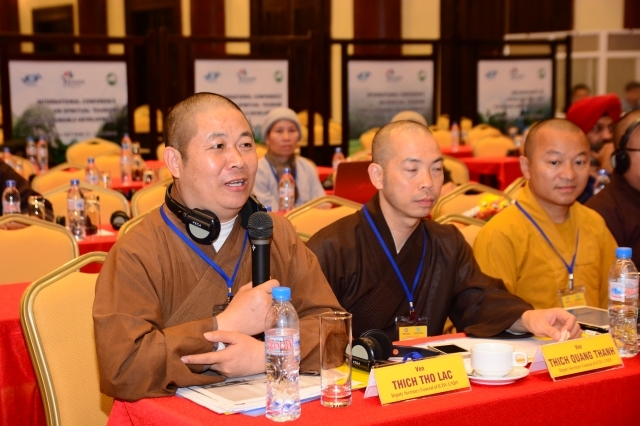 Also on 19/03/2014 evening, the IOC had a meeting to summarize issues on main speakers, important and other speakers in forums. 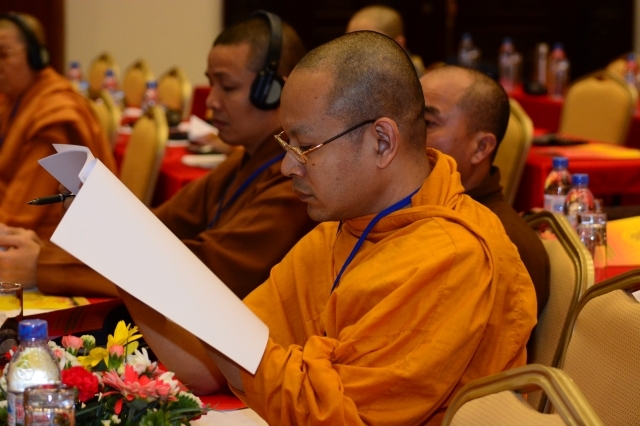 In regard to the congratulatory message of the celebration, the IOC has already sent it to the Buddhist leaders all over the world, all international politicians and diplomats. 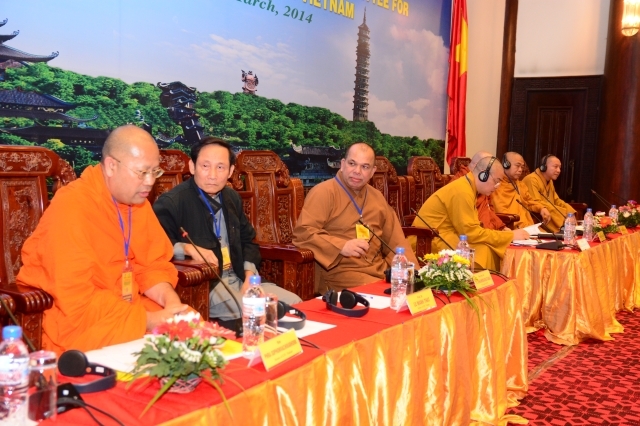 All these messages would be translated into Vietnamese language and widely published during the celebration. 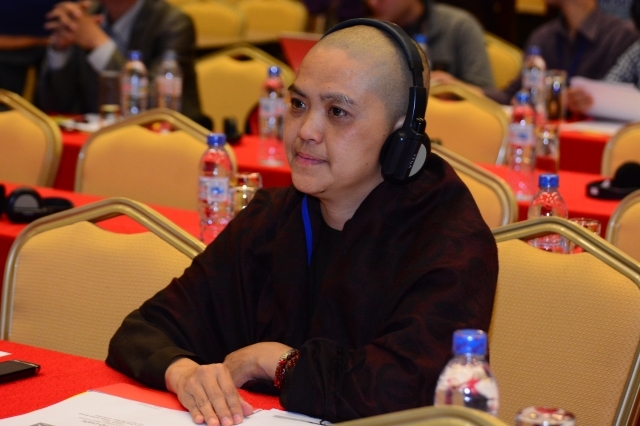 The media task is a very important problem which was deeply interesting in by members of the IOC. 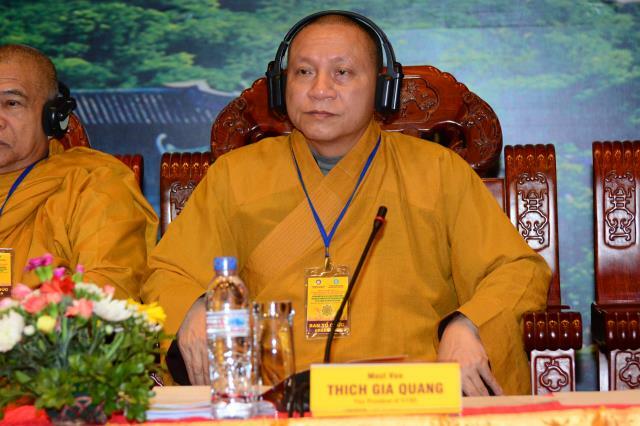 According to Most Venerable Thich Gia Quang - Vice President of the Media Section of the celebration, the IOC would hold a press conference half of the month before the celebration started. 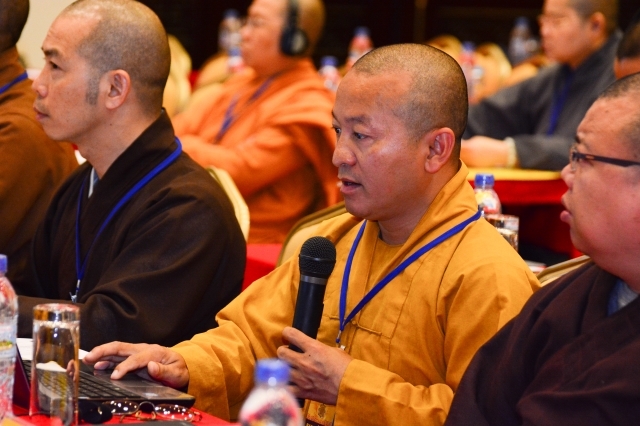 The media section also made a documentary film about Vietnamese Buddhism together with the nation in 10 episodes to show during the celebration. The issues concerning to television and photography were also planned specifically. 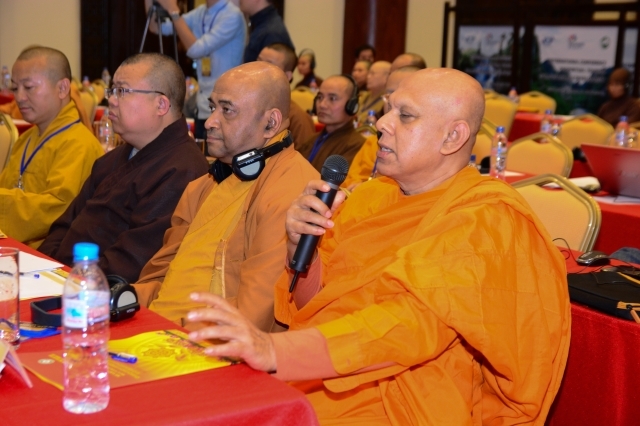 According to assigned program, international performance night will be held on the evening of 08/05/2014 with the participation of performance troupes from India, Sri Lanka, China, Thailand and the hosting Vietnam. 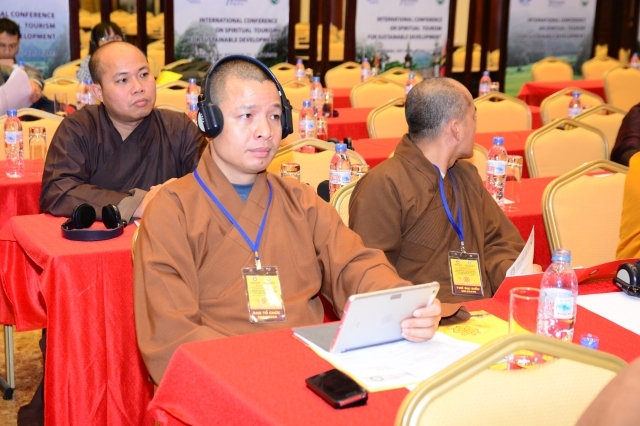 Accordingly, in addition to the repertoire with bold cultural characteristics of the countries, Vietnam delegation had an opportunity to introduce international friends to the international character of ethnic arts and culture. 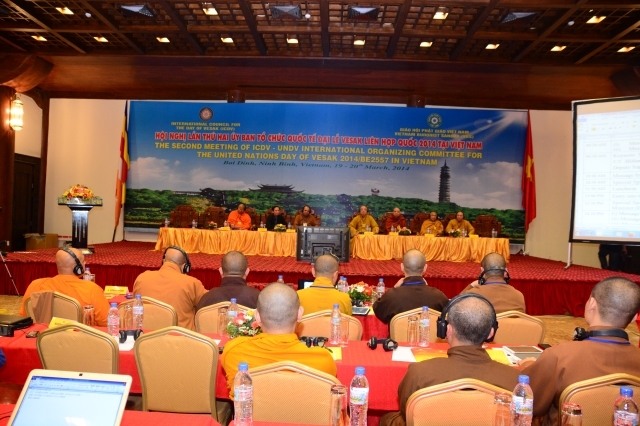 It is also on the activities during the celebration, the programming draft of national exhibition and International Buddhist Film Festival shows were also roughly presented. 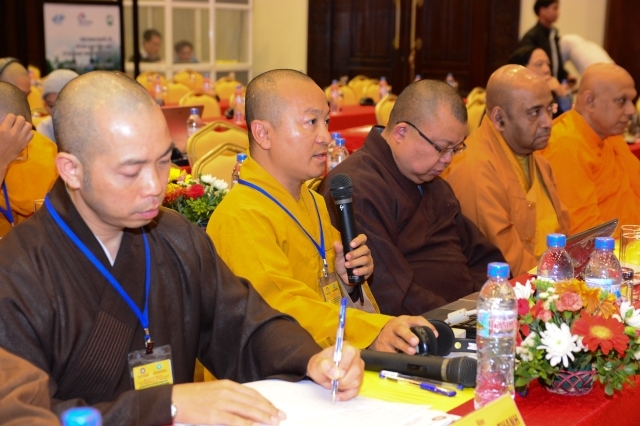 The meeting also defined that the 3rd preparatory meeting would be held on 07/05/2014.